Located on the edge of the White Mountain National Forest, The Blake House affords delightful scenery year round, as well as a full range of recreational activities. The Blake House is open year round. 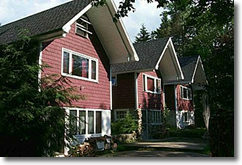 Jeff and Sarah have been operating The Blake House B & B in the European tradition since they started in the summer of 1977.Hands-on, friendly, involved hosts Jeff & Sarah are happy to chat with guests on downhill and cross country skiing locations, hiking trails, restaurants, swimming locations across the road in the Ellis River, etc..
Blake House Special- Non Holiday midweek stays of 5 nights or more get one night free! 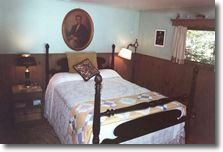 We have four guest rooms and a warm and friendly atmosphere. 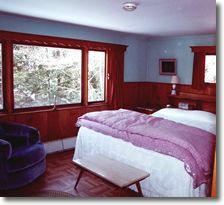 We offer cozy bedrooms, guest living room with fireplace, breakfast dining room with cathedral ceiling and fireplace, patio, porch, and attractively landscaped grounds all next to the White Mountain National Forest. Great mountain views as well as the babbling brook and rushing river; and plenty of activities to choose from during all the seasons-five downhill ski areas, Jackson Ski Touring Foundation l54 km trail system, golf, tennis, hiking, Storyland & Heritage NH, Conway Scenic and Cog Railroads. We are ideally suited to couples, families and small groups. Get a good start in the morning with a country breakfast-freshly ground coffee, lots of teas, freshly baked breads and muffins, fresh eggs from our own hens, and just ask if you'd like sausage, bacon, French toast or pancakes! Afternoon or evening tea, etc. always available. We are located on Route 16/ Pinkham Notch Road four miles north of Jackson Village. at 15 Blake House Dr. Need help getting here go to Map it! Our barn red sign marks the drive into the property. Copyright 2010 The Blake House.